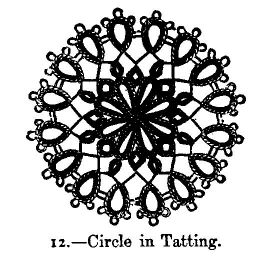 Materials: Messrs. Walter Evans and Co.'s tatting cotton No. 50; tatting-pin No. 3. This strip of insertion is worked with two cottons. Work with the cotton in the left hand over that in the right hand. Both ends of cotton are fastened together at the beginning by a knot. First work one half of the insertion the long way in the following manner:--1 plain, 1 purl, 1 plain (the purl must be very short); turn the purl downwards, 6 double, 1 purl, * 6 double, 1 purl, 1 plain, which must all be turned upwards; then turn the work so that the upper edge is turned downwards; work 6 double, fastened on to the last purl turned downwards (the fastening of the stitches is made with the thread in the right hand); a loop turned upwards is thus formed; turn the work downwards, draw the cotton in right hand underneath that in left hand, and work 6 double, 1 purl, 6 double, all turned upwards; fasten these stitches on 1st purl turned downwards. In this pattern 1st of border pattern is thus completed; turn it downwards, 8 double, 1 purl, 8 double, 1 purl, 1 plain, turn work downwards, 6 double, fastened on last purl of last pattern, turned up. Repeat from *. When the insertion is of sufficient length, work the other half in same manner, and fasten it on the 1st half by means of purl stitches between the 8 double stitches twice repeated. 11.--Tatted Insertion for Trimming Lingeries. 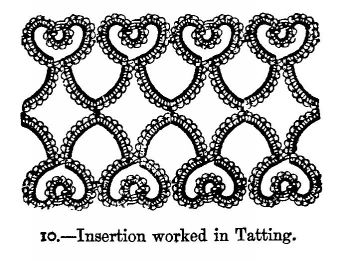 Materials: Messrs. Walter Evans and Co.'s tatting cotton No. 40, or crochet cotton No. 20; tatting-pin No. 3. This insertion consists of 2 rows of three-branched patterns which lie opposite each other, and are joined by slanting rows of knots. A coloured silk ribbon is drawn through these rows which join the patterns. Each of the 3 branches of 1 pattern consists of 9 double, 1 purl, 9 double, and must be worked close to another. When the 3rd branch is completed, fasten another piece of cotton on to the middle branch. Work 12 double over this 2nd piece of cotton, and then work without the 2nd piece of cotton a 2nd three-branched pattern like the 1st. * Fasten the 2nd piece of cotton on to the middle branch of the just-finished pattern, work 12 double over it, then again a three-branched pattern; in this pattern as well as in the following ones, instead of working the purl of the 1st branch, fasten it on to the purl of the 3rd branch of the preceding three-branched pattern of the same row, as can be seen in illustration. Repeat till the strip of insertion is sufficiently long. Materials: Messrs. Walter Evans and Co.'s tatting cotton No. 80; tatting-pin No. 3. Work first 8 ovals, each composed of 5 double stitches, 3 purl divided one from the other by 4 double stitches, 5 double stitches; these ovals are joined together by the purl at the sides, then the circle is tightened as much as possible, and the cotton with which you are working is twisted round the ends of cotton that have been cut: the cotton is then fastened off nearly underneath. Begin a fresh small oval, composed of 12 double stitches, which should be fastened to the preceding oval after 3 double stitches (to the purl in the centre of the first oval), then fasten it again to the purl which joins together the first and the second oval; leave a space of about one-fourth of an inch, and work an oval composed of 4 double stitches, 5 purl, followed each by 2 double stitches, 4 double stitches. A very little farther off make a very small oval, composed of 8 double stitches, which after the four first double stitches is joined to the centre purl of the second oval, leaving the same space between as before, make another oval of 4 double stitches, 5 purl, each followed by 2 double stitches, 4 double stitches; but the first purl is missed, because at this place the oval is joined to the fifth purl of the corresponding oval; once more leave a space of one-fourth of an inch, and repeat. At the end of the round the two ends of cotton are tied tightly together.